Candidates age should be 66 years for S.No-1 to 5, 55 years for S.No-6 to 11, 20, 22, 24 to 26, 50 years for S.No-12 to 17, 23, 28, 30 to 32, 35, 40 years for S.No-18 & 21, 29, 40 & 41, 35 years for S.No-35, 27 & 42, 45 years for S.No-33, 30 years for S.No-34, 37 to 39 & 44, 33/30 years for S.No-43 as on 15-02-2015. Age relaxations are applicable as per the rules. Candidates should have Medical qualification, MD, DM or equivalent, PhD in Molecular Biology from recognized University/ Institute, MHA/ MD (HA) or equivalent degree, MBBS, Degree in any discipline or equivalent qualification, M.Sc, B.Sc/ Diploma & PG (Nursing), 10+2, B.E with relevant experience. Shortlisted candidates will be called for test/ interview. Candidates should have to pay Rs.100/- for SC/ ST & Ex-SM candidates, Rs.500/- for Other candidates through Bank draft drawn in favour of Institute of Liver and Biliary Sciences payable at New Delhi or can also transfer their application fee directly to ILBS Account No.CBCA01001116 through Corporation Bank, PBB, Vasant Kunj, New Delhi 110070 having Swift Code No.CORPINBB.373 (International) and IFS Code-CORP0000538 (for domestic remittances). Persons with disabilities and visiting consultants are exempted from fee. The name of the candidate and the post should be written on the back side of the demand draft. Online Application: Eligible candidates can apply online through the website www.ilbs.in & send their printout copies of applications along with attested copies of age proof, qualification certificates/ mark sheets, demand draft experience certificate, NOC, recent passport size photo etc & other relevant documents to the Dy. 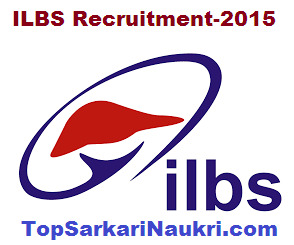 Head (HR) at Institute of Liver and Biliary Sciences, D-1, Vasant Kunj, New Delhi-110070 on or before 15-02-2015. The documents containing envelope should be superscribed as”name of the post applied for and post code number in Bold Letters”. 1. Before applying online candidates have to scan the copies of photograph. 2. Candidates have to pay the fee through demand draft or can transfer the amount to prescribed account. 3. Log on through the website www.ilbs.in. 4. Click on the “Career Opportunities” —> Select the appropriate position applied for. 5. Read the notification & instructions carefully before applying online. 6. Now click on the “Apply Now” button and Click on the “New Entry” button. 7. Fill the personal details and click on submit button. 8. Now fill the other details in the application form and upload the scanned copy of photograph. 9. Now click on the submit button and an unique code with password will be displayed on the screen. 11. Now send a copy of application form with DD & other relevant documents to concerned address. Eligible candidates can send their applications in the prescribed format along with attested copies of age proof, qualification certificates/ mark sheets, demand draft experience certificate, NOC, recent passport size photo etc & other relevant documents to the Dy. Head (HR) at Institute of Liver and Biliary Sciences, D-1, Vasant Kunj, New Delhi-110070 on or before 15-02-2015. The documents containing envelope should be superscribed as”name of the post applied for and post code number in Bold Letters”. Last Date to Apply Online: 15-02-2015. Last Date for Receipt of Applications: 15-02-2015.